These words of wisdom were almost prophetic. I suffered from a right knee malfunction (more specifically an inflammation of a bursa below the knee according to my PT) at mile 24. I could not run a single step after that. I spent about 36 minutes walking the last 2.2 miles to the finish. I would not have been the first nor will I be the last underprepared runner to have been destroyed by such downhill courses. 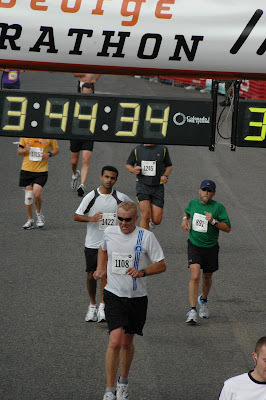 The one good thing that might come out of this is that I have lost any desire to run another marathon (at least in the near future) without having a realistic shot of a 3:15 or 3:11 finish. That could be validated by running a sub-1:32:30/1:30:30 half-marathon somewhere. 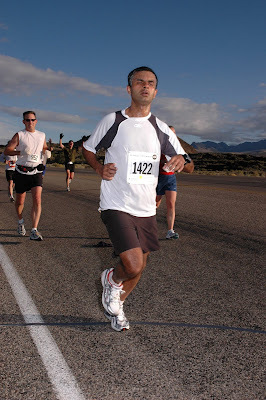 It is unlikely that I will run a spring marathon in 2008, perhaps not even a fall marathon. 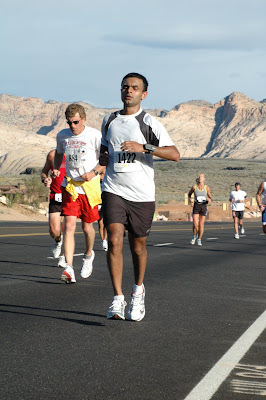 When I had sent in my entry for the St George Marathon lottery I had high hopes for this race. However, for a number of reasons I did not get in the intended training. Five weeks before the marathon I aggravated my gluts/ITB while overdoing a hilly run. At that point I was not even able to get through a single mile without the injury surfacing. 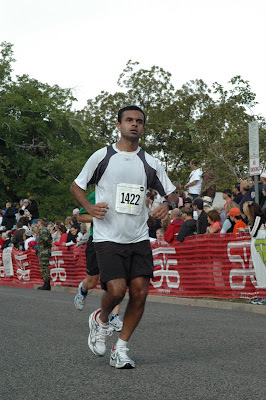 I worked very hard with the help of my PT to get to the point where I would be able to finish the marathon. Running a downhill course with ITB issues would be a non-starter. A more sensible option might have been to run a different marathon later in the year. This would not have worked for me. I was committed to this trip so either made it to Utah and did not run the marathon or I took a crack at it hoping for the best. I was staying at a lodge outside Zion national park. This meant heading out for the shuttle buses at 3am. Interestingly, I got pulled over by a cop enroute. I though he was going to give me a speeding ticket. However, my transgressing was having my high-beams on, on an undivided highway. I pleaded ignorance claiming that this was a rental car. The folks in St. George sure are informed about their marathon. Cop: "So you are running the marathon?" Cop: "Do you think you will make it through all 26 miles?" Me: "I hope so sir"
Me: "I have a time goal officer." Cop: "What time are you shooting for?" Cop: (Letting me go after a few more minutes of examination) "Good luck at the race"
It was in the 30s at the start in Central. Most of the runners were huddled around the fires set up. What a unique atmostphere! The organizers had some decent music playing. They had the planning down to the T - gatorade, water, bananas, enough porta porties. The organizers even offered to replace lost or forgotten their chips/bibs. I have rarely felt as bad while running as I felt during the first mile. I was very cold. My legs were tight. It was dark and I had to work through the runners. I noticed that my pace through the first half mile was just 8:15. Gradually after mile 2 I began to feel better and get into some sort of a zone. I was consciously trying to cut tangents. What was great was that throughout the race the mile markers were in sync with my Garmin splits. As we reached Veyo the sun was rising. I must confess that I was working too hard to appreciate any aesthetic beauty. Luckily I had admired the beauty of the course during my drive the previous day. On the elevation map the Veyo climb is just a blip but the scale is deceptive. I was not unduly perturbed about my pace. In the running clinic at the expo the speaker had spoken of the importance of not losing it at Veyo. I was not getting passed by runners either so considering my fitness I was doing OK.
St. George has been mentioned as one of the easiest courses to run a negative split on. I could see why. Runners around me had been talking about goals of 3:20 even with a 1:44 half split so that must say something. 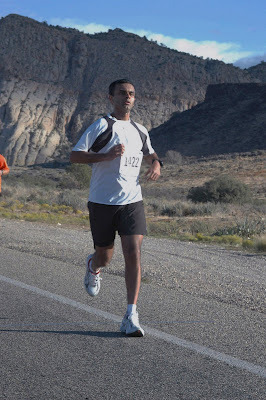 I did my best to save my legs though the downhill pounding but it's hard to disguise a lack of training. track for - I had said 7:40) asked me how I did. All I could tell him was "Not good". He consoled me saying atleast I finished. The assortment of ice cream at the finish was great. The stone medal was unique. Having the chip as a sovenior was neat. A top quality race! This marathon did not end the way I wanted it to end. I really cannot be disappointed - I have to realize that I just was not prepared for the course. Things could have been much worse if my ITB issues kicked in or my knee gave way earlier. 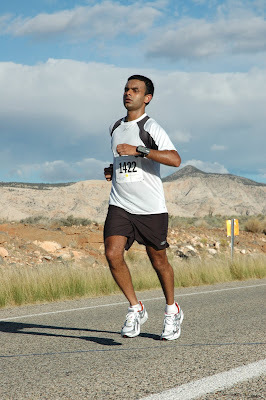 St George is one of the best organized marathons I've run. It's amazing how well the aid stations were stocked. They had pretty much everything a runner might need. I surely recommend this one (ONLY if you've prepared for the down hills). I will be back someday (WELL PREPARED) for my redemption. I don't know when my next marathon will be but for the near future I'll be focusing on getting my half-marathon times down. I'll have a lot of time to run crappy marathons later but I want my next marathon to be one in which I have a realistic/sure shot of a PR! The remainder of my trip was awesome - Zion, Bryce, Arches, Canyonlands, and Grand Canyon. Some of the most amazing things I've ever seen in my life. Sorry to hear about your knee Sub... and SO CLOSE! Argh. Let all those nagging injuries fully heal. 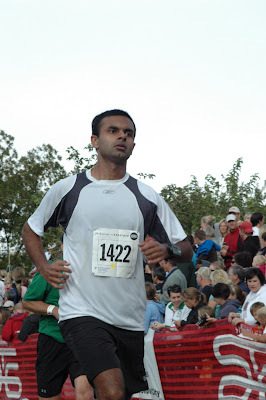 I know you have it in you for a sub 3:15 finish, you just need everything to line up. It will happen. Bummer about the knee; hope it's feeling better. Great report and pictures.